What is Thermal Auricular Therapy? The Hopi (meaning peaceful) people are a Native American Indian tribe of North Arizona and it was these that brought the practice to Europe. They were a tribe with a great medicinal knowledge and a high degree of spirituality. Ear candles were traditionally used by Shaman healers in initiation and healing ceremonies. This is a pleasant and highly relaxing non- invasive treatment, suitable for both adults and children. A light suction action known as a chimney effect and the movement of the flame creates a vibration of air in the candle; this generates a massage-like effect on the ear drum. The gentle heat of the candle stimulates blood and lymph circulation which increases the removal of waste products. The concentrated vapour which is infused with herbs and essential oils helps to sooth and calm irritated ears. A pleasant crackling sound and a feeling of warmth can be felt during the treatment. Freer nasal breathing and an improved sense of smell may spontaneously occur during treatment. The whole treatment brings a wonderful sense of relaxation and peace. A consultation is carried out first to rule out any contraindications to treatment. The client then lies on the plinth with a pillow under the head. 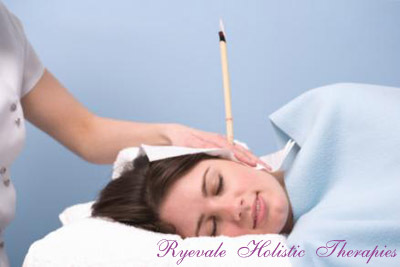 The candling of the ears is done first, this takes approximately 25 minutes. 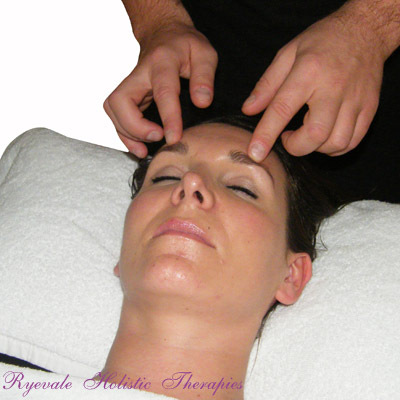 An acupressure facial massage then follows. This enhances the treatment as it helps with lymphatic drainage, this cleans the facial lymph as such and helps eliminate the build-up of waste and toxins. Additional blood and oxygen flow to the area and gives a more youthful healthier glow. When the treatment is finished it is important to have a rest period of about fifteen minutes. During this time I will do some Indian Head Massage or Reflexology on each hand to enhance the healing effect of the treatment. You will remain lying on the plinth until the treatment is complete. Excessive or compacted ear wax. Pressure regulation in the case of sinusitis or rhinitis.